Hay entries will be judged using NIR testing procedures by the University of Georgia Feed and Environmental Water (UGA-FEW) Lab. The entries will be ranked using the Relative Forage Quality (RFQ) evaluation system, which accounts for protein, energy and fiber digestibility. If necessary, ties in RFQ scores will be broken based on Crude Protein and Total Digestible Nutrient (TDN) Values. 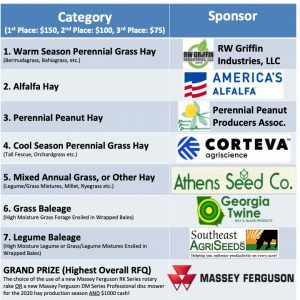 GRAND PRIZE (Overall Highest RFQ): The use of a new Massey Ferguson DM RK Series rotary rake or DM Series Professional disc mower for the 2020 hay production season AND $1000 cash! All Entries Must Be Received by the FEW Lab by: 5 p.m. on Thursday, September 19, 2019. Click here to download the RULES and ENTRY FORM!